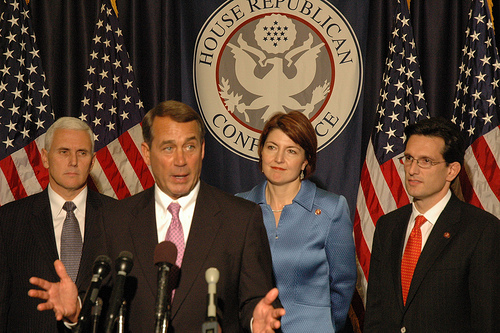 America's credit rating was intentionally sabotaged by Congressional Republicans. That's the conclusion that most economic observers and Wall Street have just come to about the debt ceiling mess. In response to this perception - and to the recent dangerous power plays to damage the president in Washington - Standard & Poor yesterday historically downgraded the United States of America's credit rating from AAA to AA+. The agency was responding to Washington's apparent complete inability to reach an agreement on how to address the large fiscal gaps in our economy, or how to align revenues with spending commitments. Closing the financial gaps, it is generally accepted, will require tax increases and the closure of tax giveaways to the rich, otherwise the money can simply not be raised. Remember that today taxes as a percentage of GDP are at historic lows and corporate tax receipts as a percentage of GDP are also at historic lows. Not so, say the Republican party, who have now elevated tax cuts to the realm of a near religious faith. Taxes, they claim, should never go up - only down. It makes perfect sense to them that CEO's and hedge fund managers should pay lower tax rates than high school teachers. We should never return to the dark days of the 1990's or the tax rates of that era, they cry. Add to that insuperable creed a blanket refusal to compromise with Democrats on any major legislative issue - and add a general Tea Party contempt for a working government and its international relations and commitments - and yesterday's downgrade can be seen for what it is: cold water over the faces of suicidal ideologues. Everyone in America, from fiscal reform groups to the general public, had accepted that spending cuts and tax increases were inevitable. But Congressional Republicans now believe that anything that is requested by President Obama must be refused by them, regardless of the ultimate cost to the nation. The result was a modest deal composed of spending cuts - and even that was opposed by a sizable number of Congressional Republicans. In seeking to the end the Obama presidency Congressional Republicans have overreached and brought about an end to the American Empire instead.